The rocker panels on your Toyota Tacoma were not designed to handle hard impacts. Anyone who has ever bottomed their truck out while off-roading, or had the misfortune of dragging frame on a rock that was just a little bit higher than they thought it was can attest to this fact. The metal used on Tacoma rocker panels isn’t any thicker than any other area of the body, which means that dents and punctures are a very real possibility while out on the trail. Eventually, this could lead to corrosion, not to mention the fact that not everyone is comfortable with driving around a beat-up truck – especially if you have to take it to work on Monday morning. 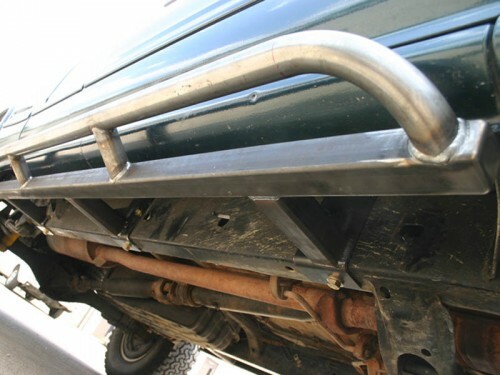 Some off-road novices install side-mounted nerf bars or tube steps in an effort to mitigate the damage caused to rocker panels by undercarriage impacts. Unfortunately, these accessories are often designed merely for looks and don’t offer any real protection. In fact, they can actually make things worse by crumpling into the side of your truck after hitting a particularly nasty rock. Serious Tacoma trail cutters know that the best way to protect your rocker panels – and other parts of your chassis – is to install rock rails. Also known as rail sliders, this bit of gear is either bolted or welded onto your truck’s frame, introducing a solid steel bar that mounts horizontally along the length of your Tacoma’s rocker panels. Rock rails are typically angled – by as much as 45 degrees – in order to facilitate sliding across obstacles or terrain instead of digging in or meeting them head-on. Essentially, rock sliders take the brunt of any unexpected impact instead of relying on the soft metal of your rocker panels to absorb the blow. Shrockworks Rock Sliders seen from below after bolt-on mounting. There are a number of different styles of rock rails available on the aftermarket. Some feature an aggressive look that screams “trail warrior,” while others adopt a more subdued appearance that provides the same level of protection while maintaining stock sensibilities. As mentioned above, mounting is usually welds or bolt-ons. A long list of rock slider vendors are out there, including trusted names such as Shrockworks, Rocky Road Rockrails and Demello. Some even choose to fabricate their own rock sliders using 3/16-inch hitch steel. With prices starting at around $350, a set of rock rails for your Tacoma is cheap insurance compared to the price of body repair – not to mention the potential structural issues associated with repeated trail damage. What rock rails do you use? Let us know. Benjamin Hunting is a freelance automotive writer who has been involved in racing, restoring and writing about cars and trucks for more than a decade. In his spare time he enjoys keeping the shiny side up on track days. You can find out more about Benjamin’s writing at his website, http://www.benjaminhunting.com.